Flick a switch, and the lights in both the living room and hallway come on so you don't have to worry about finding your way to the bathroom in the dark. You can do this light switch wiring in one of two ways. The most common is to daisy-chain the light fixtures by connecting them to each other and hooking the first one up to the switch. The other way to wire multiple lights to one switch is to connect all of them directly to the switch in a "home run" configuration. The second option allows you to easily disconnect fixtures you no longer want to use, but it becomes cumbersome when more than two fixtures are involved. 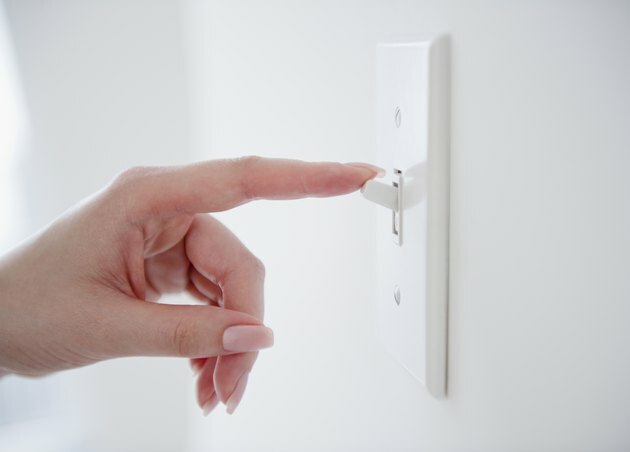 Make sure to turn off the circuit breaker for the light circuit before doing any wiring. It's a good idea to double check by testing wires with a voltage tester before you touch them. Before you can wire multiple light fixtures to a switch, you have to know how to do just one. Every 120-volt circuit that powers lights in a typical home has two conducting wires and a ground. One of the conducting wires is black, and it's the hot one, meaning it carries the electricity on its outward path from the power source to the load. The other conductor is white. It's the return wire that completes the circuit from the load back to the power source. A switch interrupts the hot leg of the circuit, so it has terminals only for black wires (and ground). The terminals are brass. You connect the black wire from the power source to one of these brass terminals – the line terminal – and the black wire going to the light fixture to the other, which is the load terminal. That leaves two white wires and two ground wires in the box. What do you do with those? The return path from the load bypasses the switch, so the white wires simply get spliced – or joined together. You do this by twisting the exposed ends together and screwing on a wire cap. The ground wires also get twisted together, but they also have to be connected to the green ground screw on the switch. This is easy to do if you leave one wire longer so you can wrap it around the terminal. Daisy-chaining isn't the same as wiring lights in series. If you wire lights in series, they'll all go out when one of them fails. When you daisy-chain light fixtures, you're wiring them in parallel, and standard electrical color-coding makes this easy to do. If you're only connecting a single light fixture to a switch, you'll have one live cable with a black, white and bare ground wire in the fixture box. Connect the black wire to the black wire on the light, the white wire to the white one on the light and the bare one to the ground wire or the ground screw. If you want to add a fixture, you'll need an extra cable in the box that goes to that fixture. You'll probably run that cable through the attic. Simply add the black wire to the two black wires that are already there, then do the same with the white and ground wires. You may need larger wire caps because you're increasing the number of wires in each set from two to three. You can use the same procedure to connect another fixture to the one you just added, and you can keep adding fixtures until the total current draw of the circuit reaches the limit of the breaker rating. There aren't many reasons to feed wires from multiple light fixtures directly to the same switch. One might be that the switch box is easier to access than any of the fixture boxes and another that the wiring is temporary and you want to be able to disconnect the new light easily. In home run light switch wiring, each outgoing hot wire must be connected to the load terminal of the switch. The best way to do this is to make a pigtail, which means to twist all the black wires going to fixtures together with a 6-inch length of spare black wire. Screw a wire cap onto the spliced joint, then connect the short wire to the load terminal. Use the same technique to connect the ground wires to the ground terminal. When you get to the white wires, you don't need a pigtail. Simply twist them all together and cap them. This configuration gets cumbersome when you connect more than two fixtures to a single switch, and you may need a larger electrical box to accommodate all the wires.